One element that sets this book apart from others in the romance genre is Martina Vanderley’s approach to unexpected love from a mid-life perspective. Leslie and Tom are both gray-haired individuals who are reaching the end of their active professional years, but yet still remain intellectually curious with many interests. With their children all grown, they are well out of the intensity of the child-rearing years. Their late-in-life passion reawakens their youthful ardor. The author refreshingly details the blossoming romance of these two long-married grandparents who still have the capacity to become swept up in the crazy irrationality of illicit love. Furthermore, Vanderley’s balanced presentation of a bi-racial relationship provides another entirely unique element to Crossroads at the Wilderness. I must admit when the author has Tom addressing Leslie as “milady” at their first meeting, while Leslie refers to him as “the black man” and “ladykiller,” I became apprehensive that this book might become a stereotype-laden suburban fantasy. However, on the whole Vanderley’s inclusion of the African-American perspective of bi-racial romance adds an interesting nuance to this story that mainstream audiences may find compellingly distinctive. A native of Holland, Vanderley’s writing style has a stiffness and formality to it. Nevertheless, she illustrates the scenes with specifics and details. 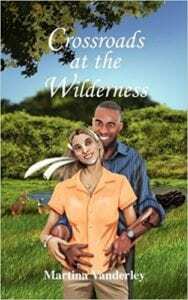 Although there is conflict and tragedy, Crossroads at the Wilderness provides an escape from reality into a world of passion, melodrama and romance while still maintaining its firm footing in everyday life. Fans of this genre may enjoy Vanderley’s unique take on forbidden passion between people of a certain age. Quill says: When unexpected passion occurs at middle age, Leslie and Tom’s lives take unforeseen twists and turns in this distinctive romance novel. For more information on Crossroads at the Wilderness, please visit the publisher's website at Outskirts Press.com.